When I took a break from reading The Lonely Polygamist, this is the book I picked up. I've had it on my TBR for years. I really enjoyed the first Sittenfeld I read, Prep, but I couldn't help but think her follow-up sounded somewhat chick-litty, which is probably why it sat on my shelf unread for so long. Turns out, it's not as awesome as Prep, but it was a very enjoyable read nonetheless. 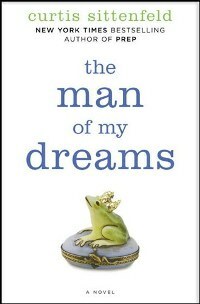 Man of My Dreams follows Hannah Gavener, an ordinary young woman, from adolescence into her late 20's. It's less about a man, as the title implies, and more about growing up and finding oneself. It's about bouncing back after making mistakes and finding happiness in oneself instead of relying others to provide it. Moreover, it's about adjusting to the realities of life and understanding where you thought you'd be doesn't always match up to where you actually are. The protagonist reminded me a bit of Hannah from HBO's Girls (seriously, the best show on TV), and not just because they have the same name. Mostly I thought of the other Hannah because they are both a bit awkward, have low self-esteem, and are unsure as to where their life will take them. Only Hannah from the novel isn't as funny as Hannah from HBO's Girls, not even close. And now that I'm thinking about it, Hannah's cousin Pip reminds me of Jessa. Hmmm... But I digress, Man of My Dreams turned out to be a fun, quick read, which was exactly what I was looking for when I picked it up. I haven't heard of either of these. And I was just talking about how I wanted to see Girls because I've heard it's really really REALLY good. I don't have cable.. or a tv for that matter. But I'm sure I'll see it someday. Sounds like it was the perfect read for a break from the other title. On another note: I was tempted to start East of Eden when you said you were reading it on Friday. I probably won't now, but I'm looking forward to your review. It's such a chunker. Also - I'm not very far along with East of Eden yet if you want to jump in! I'm about 125 pages. It is so long but it reads easily - straightforward language and plot. I think I got way to hung up on it not being as good as Prep that I may not have given it a fair chance. Have you read American Wife? It's really good. I have not but I plan to! It was kind of a bummer Prep was better than this one but I still liked it well enough. I am obsessed with Curtis Sittenfeld. I think she is THE BEST! Read American Wife, you will love it!!! As American Wife is my favorite book, I can't believe I still haven't made time for this one. It sounds like it might make a lovely vacation book. Also, I am with you about Girls. It's amazing. American Wife is your favorite book?! Wow now I've got to read it. Did you read Prep? I really enjoyed Prep but haven't even heard of this one! PREP WAS SO GOOD! I kind of stumbled across this one. I have such a hard time getting over my perceptions of Sittenfeld as a chick lit basher (even though her books always kinda sound they like are on the verge of chick-lit) and her nasty attitude toward other authors in very public forums (NYTimes). I'll try American Wife one of these days.